FingerTec offers 3 ways of communication, which are TCP/IP, USB and Serial Port (RS485 or RS232). If a FingerTec terminal is installed remotely and away from any network (TCPIP), USB flash disk can be utilized to transfer users and transaction data from that terminal into TCMS V3 software. 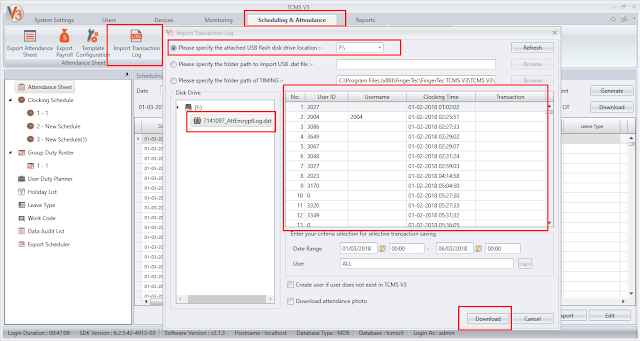 Using USB flask disks to transfer data back to TCMS V3 is simple and not costly. 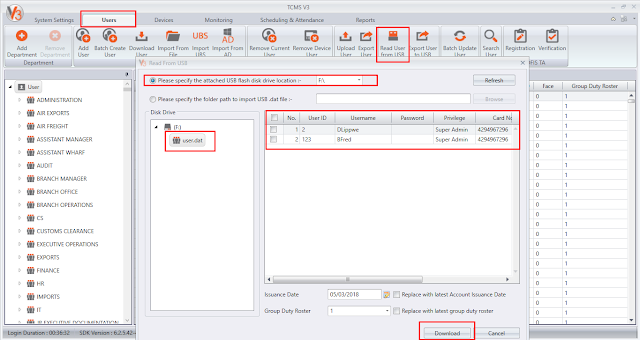 From the TCMS V3 software, you can use all the features offered, where you can download the data, store it into the software database, and manage the data to be displayed in attendance sheet and reports. Below are the steps needed to transfer data from FingerTec terminals to USB Flash Disk back to TCMS V3. Go to Devices > Add Device > Insert Device Name > Select USB under Communication Mode > Insert the terminal's Serial Num. 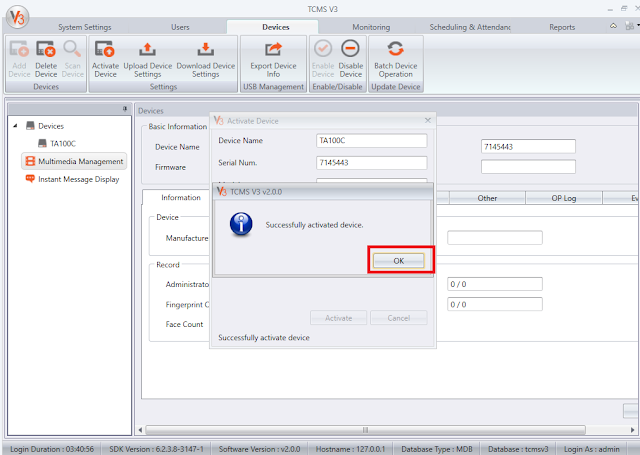 and Device ID > Select Offline under Device Activation > Insert the Product Key > Click Add. - If your PC has internet connection, you can directly select activation as "Online"
- However if there is no internet connection, you can retrieve the key from below link and select as "Offline"
A window will pop up, informing that the changes have been made. Click OK to proceed. *Important note : All downloaded USB file (in .dat format) must be encrypted. Files that is not encrypted wont be able to be read in TCMSv3 software. Plug the USB flash disk into the PC. Go to Users > Click on Read User from USB. Select the USB flash disk location > Click From USB > Select the user.dat file and click Download. A window will pop up, letting you know that the user templates and information have been successfully downloaded. Click OK to proceed. To view the user templates and information, simply go to the Users tab. Just like how users can be downloaded from a terminal into a USB flash disk, they can also be uploaded from TCMS V3 into a USB flash disk. The data can then be uploaded to your FingerTec terminals. Plug the USB flash disk into the PC. Go to Users > Click on Export User to USB. 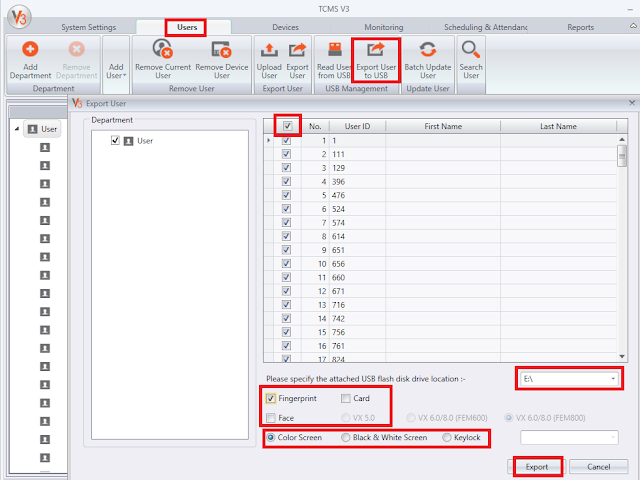 Check the boxes next to the users to be exported, or check the top box to export all users > Select the location of the USB flash disk > Select the verification type (Fingerprint, Face or Card) > Select the device type (Color Screen, Black & White Screen or Keylock) > Click Export. A window will pop up to let you know that the user templates and information have been successfully exported. Click OK to proceed. You will need to plug the USB flash disk into your FingerTec terminal to upload the data & information. Users can start using the terminal after the update is done. 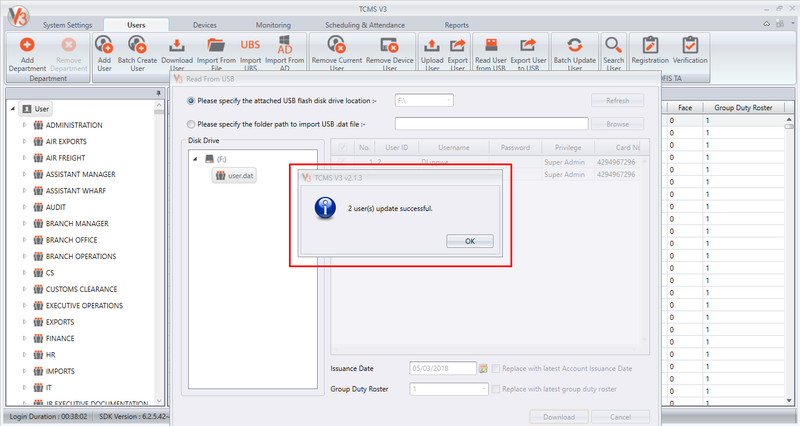 For guidance to upload the data using USB Flash Disk into your devices, you can refer to your device’s user manual. Plug the USB flash disk into the PC. Go to Scheduling & Attendance > Click on Attendance Sheet > Import Transaction Log. 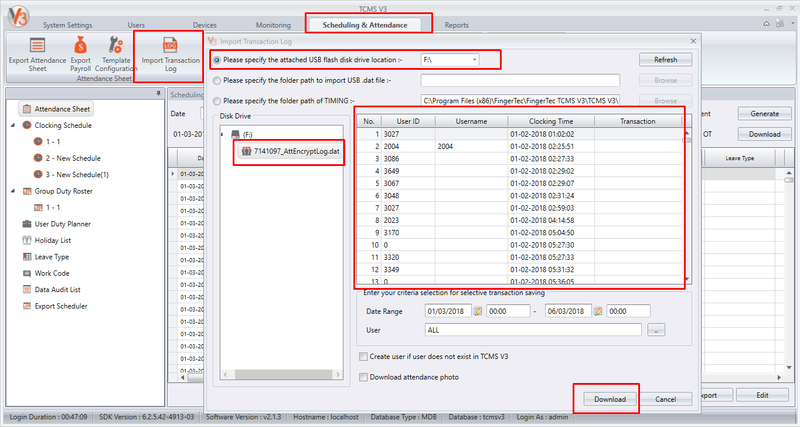 Select the location of the USB flash disk > Click From USB > Select the .DAT file > Select the relevant Date Range and User ID for the records you require > Click Download. A window will pop up. Click OK to proceed. 1. Have you done terminal activation? Download of clocking data from the terminal is not possible without the activation process being done prior. Please activate your FingerTec terminal. 2. Is configuration of the terminal ID in software exactly the same as the device number? To check the device number, follow this instruction: Press Menu > Option > Comm. Option > Dev. Number. 3. Have the device connection in the software (Comm Mode) been set to USB connection? If not, please do so. 4. Please make sure the USB file downloaded from the device is in an encrypted file format [ you can open the file by using notepad to check ]. This is applicable for certain devices such as TA100C where the encryption for USB download option can be turned on or off. 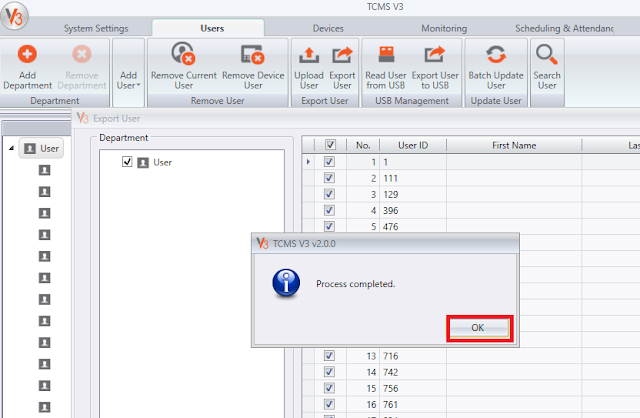 In TCMSv3 version 2.1.1.9 and above, we’ve added a new option to browse the path of User/Attendance USB file for importation to software. Before this, the option is only available with the USB flash disk drive location, where you need to copy the downloaded User and Attendance record from the terminal with .DAT file into the USB flash disk and plug it into the PC to read all the information. With this new feature, you can save the user data and the transaction log (with .DAT file) that you have downloaded inside the computer itself. At the same time, you can share the .DAT file through Email, Skype or any cloud storage. For further information, please refer to Import User and Attendance Record with USB (.dat File) from the Folder Path. 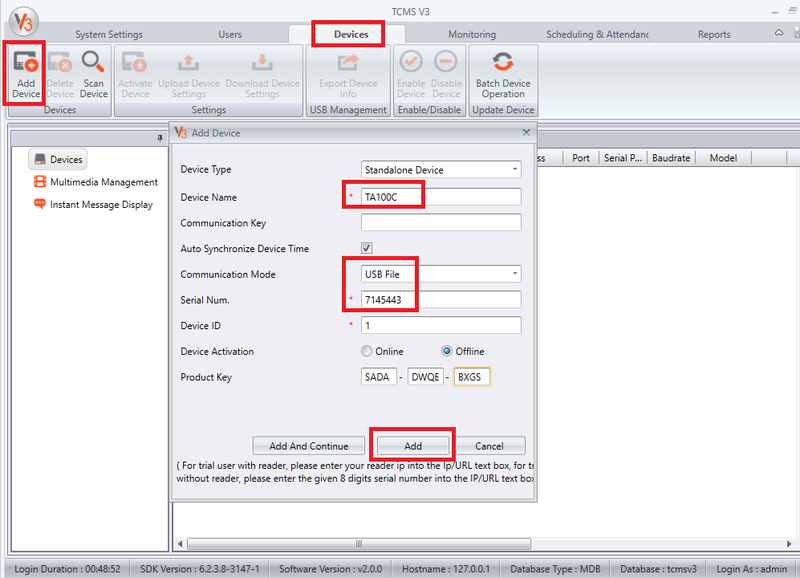 The usb device (disk drive) is not detected and no item in the list when import transaction or users ? 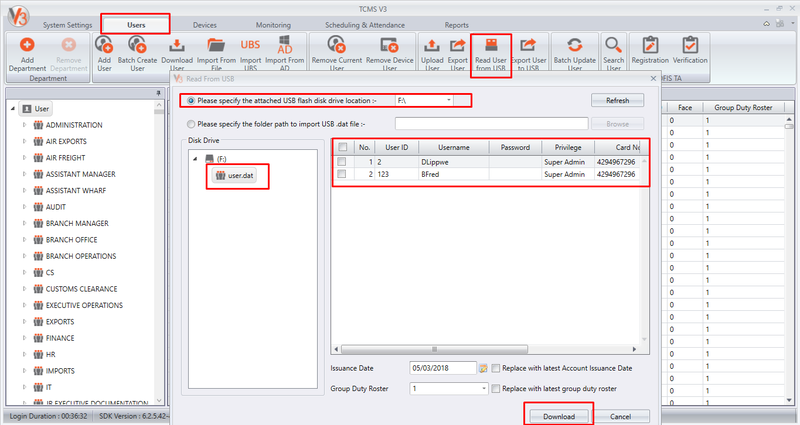 Kindly provide us the USB data for testing purpose, and also provide some screenshot for better understanding your issue to import USB data into TCMSv3 Software. At the same time, what is your TCMSv3 Software version? You can click the TCMSv3 icon (top left corner) and select about us to check the software version. a) how i get the product key? b) when i click top tap " scheduling & attendance", nothing has come out? - However If doesn't internet connection, you can retrieve from below link. 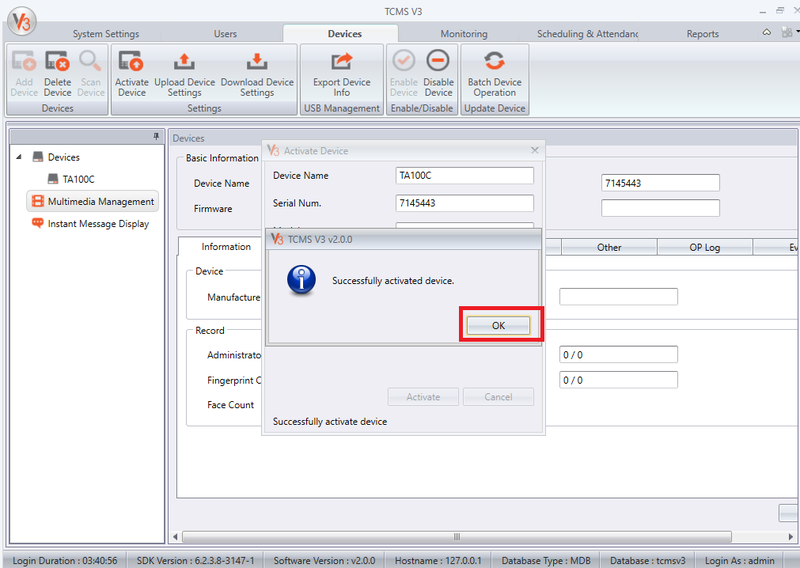 To activate in the device in the TCMSv3 Software, please select as "offline"
- You must activate your device in TCMSv3 Software first before open the attendance sheet. how i can get the product key if the data not in usb but got by email and the data was store at Download. For your information, if you need any TCMSv2, TCMSv3 or Ingress product key and activation code, you can always retrieve the key at the link below,the product key will be send to you almost immediately. where i can get the product key? Is the product key at the device? Only Supervisor/Superadmin of the device has authority to reset the device. Regarding your issue, I have replied to your email. Kindly check your inbox. When i export user data from the tcms v3 to usb it ends up saved as txt file instead of dat file. I made the ultimate mistake when initially setting up my clock. I put the super admin user password in with letters forgetting that it only accepts numbers. I uploaded it through USB and now cannot access the clock menu. It is the only user account on the clock. Is there a way to physically reset the time clock? How can I get out of this dilemma? May I know what is your device model? Kindly add my Skype ID fingertec.yusri , so I can assist to login the device menu without admin. 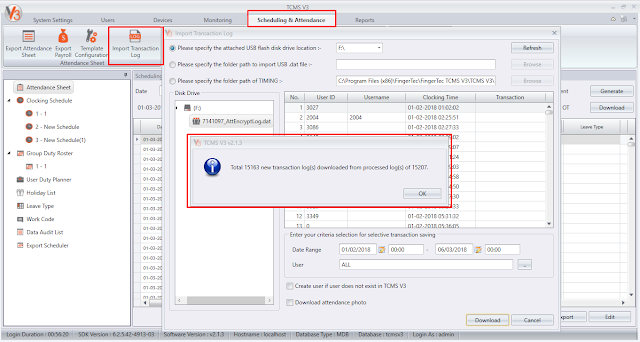 Hi sir, I am unable to Import Transaction Log, it says "0 transaction logs downloaded". When I selected the .DAT file the information displayed is fine. The file in the USB is encrypted. I am using a TA100C model. Referring to the problem, kindly check the status of transaction log that you have downloaded in Attendance tab > Data Audit List. For you info, when the transaction log was already downloaded and captured inside the Data Audit List, system will trigger the message '0 transaction logs downloaded' since there is no new log that need to be downloaded. However, if you still facing the same issue, kindly provide to us the USB log file (.DAT file) with the device serial number and screenshot picture that can show some user IDs, date range and transactions that cannot be downloaded. You can email all this info to our email at support@fingertec.com, so we can do further checking. I have already sent an email, thanks for the reply and I hope that the issue can be solved as soon as possible.